Phenomenal! 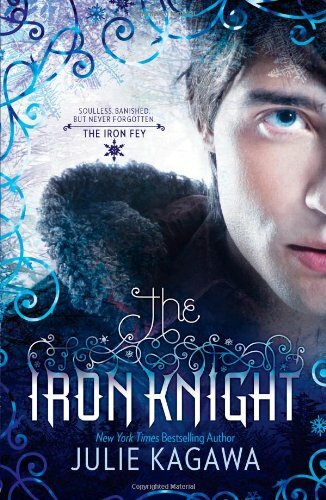 If you loved the first three books in the Iron Fey series, you must read Iron Knight. In fact, if you only tolerated the first three books, still make sure you pick up Iron Knight. The fourth and final book in the Iron Fey series is the best of them all. The book starts not long after the bittersweet ending of Iron Queen, in which Meghan banished her true love Ash for his own good. Now Ash is determined to trade his fairy soul for that of a mortal, so he can reside with Meghan in the Iron Kingdom. Reminiscent of Homer's The Odyssey, Ash sets off on a long journey of dangerous adventures to reach the place where he might become mortal. Ironic considering that Ash's quest is all about his future, much of his journey centers on his past. We learn more about his old love Ariella, his friendship/feud with Puck, and many misdeeds. Puck and Ash's banter is a highlight of this novel. I always liked how they hated each other yet also didn't. Their rivalry is a game they unwittingly came to enjoy. It's nice to see how their friendship comes full circle in this book. Kagawa has two skills that sets her apart from most YA writers: action and characters. I've encountered few authors who are as good at keeping their books full of action. The plot is perfectly paced. You have a big action scene and then a few scenes of heavy dialogue (aka sarcastic banter) and/or important character development and then another action scene. The action ensures that the reader is never bored while the character development and dialog elevate the book to a level beyond that of a swash-buckling adventure tale. Fear not the absence of your favorite Iron Fey characters. Puck and Grimalkin are crucial characters. I also loved the new creatures/people we meet, especially the Wolf. I enjoyed seeing how the Wolf was both different and similar to Grim. Meghan is not as present in this novel, but she's still there. I didn't miss her all that much. Even if she's not physically present, Meghan is the light at the end of the tunnel and is always very much "there." Iron Knight is the perfect end to a fabulous series. You'll smile, laugh, gasp, cry, fear, rejoice, and more. I can not wait to read this....I loved the first three and am anxious to read something a bit more about Ash! I haven't read the others but they seem interesting, guess I'll be adding these to my pile =). I am celebrating the release of Half-Blood so if you'd like stop by & spread the word. I didn't know this was the final book. I have the e-ARC from NetGalley but haven't started it yet. I am glad to see such a glowing review. I really liked The Iron Queen but the other two books were just okay for me. I'm kind of glad that Meghan won't be around as much as I often found her annoying. Very nice review! I had no idea that it is the last book! I agree with you on everything. This but made me cry but I loved it so much! I have yet to read a bad review on the Iron Knight series. I haven't started but plan on starting soon especially if this is the final book. The bonus for me is that the books are complete. I love when I can read books in a series back to back and not have to wait! Great review, glad you loved it! I just finished reading this book too. It was great. I feel like Julie Kagawa took us to a whole new level in this world she created. I had no idea that it is the last book of the series! I guess now is the best time to read the series. I don't have to wait anymore! Seriously though, I've heard nothing but great things about this series. I really have to read it soon. "Kagawa has two skills that sets her apart from most YA writers: action and characters." YES, yes, yes! Really. I couldn't have said it better myself. Puck and Grimalkin were phenomenal and Ash broke my heart in ways only he can, but then he took care to mend it just as sweetly. I'm so glad you liked this one too ! It was a really great end ! I liked to have a new point of view to really understand Ash. I totally agree with you ! Awesome review ! I am so excited to read this! I've been waiting for months, so I want my copy to get to me, already. AWESOME! This is exactly what I wanted to hear. I was hoping for good action balanced with character development and lots of banter. I love Ash and Puck's relationship. Now I just need to find the time to read it!